Clear your calendar – It’s going down! 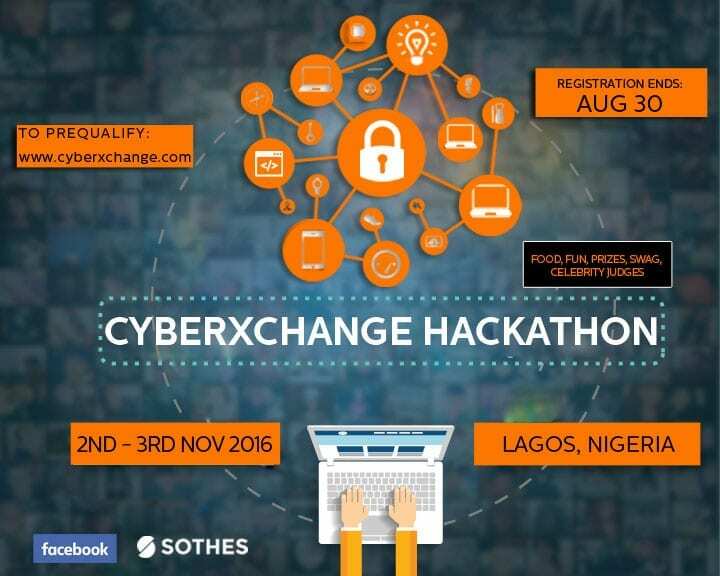 First ever CyberXchange Hackathon sponsored by Facebook to touch Nigerian soil. Come not just by yourself but with your team to compete against other university and young professionals with less than 2 years experience throughout Nigeria. The pre-qualifier registration closes August 30, 2016. You will have the opportunity to build a hack against a cyber security issue. So what’s in it for you besides being part of the CyberXchange 2016, the largest cyber security conference to set foot in Nigeria? prizes, worldwide exposure of your company and university team, and so much more. The pre-qualifier registration closes August 30th. Notifications to those who are accepted will be sent out by end of day on September 24th. The final competition will hold on November 2nd-3rd 2016 at the Landmark event Center Lagos. Qualifiers will be required to start brainstorming ideas & form a team of up to 4 people. Refreshments, fun diversions, prizes, and some expert guidance from Facebook’s team of experts will be provided. All participants need bring for the CyberXchange Hackathon are a laptop, appetite, skills and ideas. Judges for the CyberXchange Hackathon include; Regina Wallace-Jones Head of Security Operations Facebook, popular celebrity, Eldee amongst others. “We hope to discover new talents, methods and ideas; and to encourage development in the field of information security. It is our hope that besides discovering gifted hackers and cyber-defenders, the CyberXchange 2016 Hack-a-thon will inspire the development of West Africa’s Information security professionals of the future”. Hack-a-thon is a competition geared towards finding the best prototypes by starting from scratch to build a workable idea with the help of collaborating colleagues on their teams. The CyberXchange Hackathon will test the brightest and best talent in programming, cyber security, information assurance, security engineer, and other IT fields within teams of 4 to 6 people. Register now if you are up to the challenge.